There are many terms meteorologists and storm chasers use to describe different types of tornadoes. You may have heard of a wedge tornado or a landspout, but what do they mean? To answer that question, here's a closer look at the different types of tornadoes you may hear about. Wedge tornado is a slang term used by meteorologists and storm spotters to describe a wide tornado, but not every large tornado is considered a wedge. In general, a wedge tornado should be "at least as wide (horizontally) at the ground as it is tall (vertically) from the ground to cloud base," according to the National Weather Service. Many wedge tornadoes are violent, causing EF4 or EF5 damage, but not all of them are that strong. An example of a wedge tornado is the EF5 that struck Joplin, Missouri, in May 2011. As the name implies, this tornado has multiple vortices rotating around a center of a larger tornado circulation. These so-called suction vortices are occasionally visible if the larger tornado circulation doesn't have too much debris to obscure them. The Storm Prediction Center says multi-vortex tornadoes are capable of causing "narrow, short, extreme swaths of damage that sometimes arc through tornado tracks." 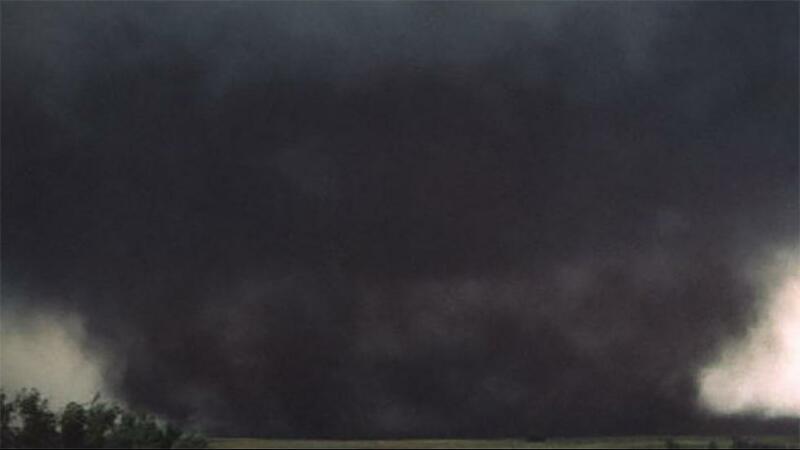 A tornado that struck El Reno, Oklahoma, on May 31, 2013 is an example of this type of tornado and featured intense vortices within its larger circulation. Mobile Doppler Radar measured winds of 200 mph or greater associated with those vortices, illustrating how they can cause smaller areas of extreme damage. This type of tornado is obscured by heavy rainfall, and sometimes it's impossible to know if a twister is there unless verified by radar or other sources. Rain-wrapped tornadoes are associated with high-precipitation supercell thunderstorms or can be embedded within squall lines (a line of intense thunderstorms). 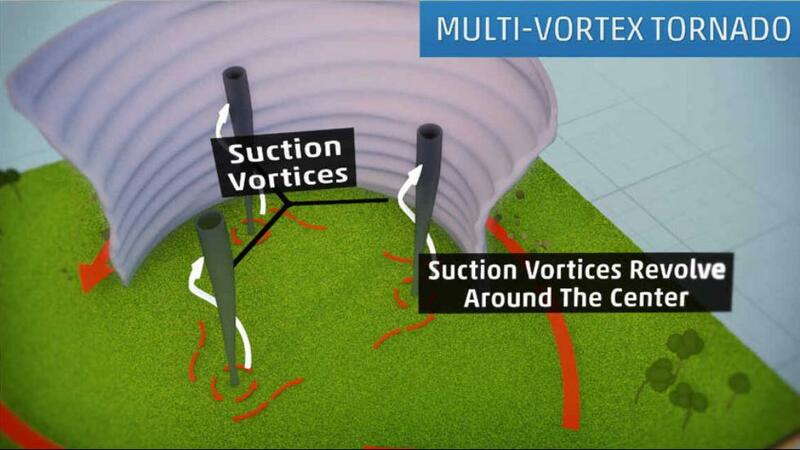 These two types of tornadoes are probably the most familiar and are visually similar. The cone tornado is wider at the base of the clouds and narrower near where it touches the ground, which is how most people think of a tornado's appearance in a traditional sense. 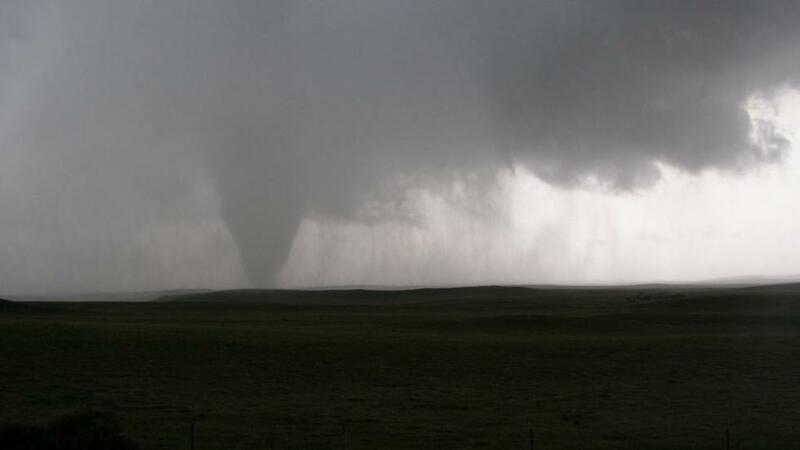 A stovepipe tornado is about as wide near the cloud base as it is along the ground. 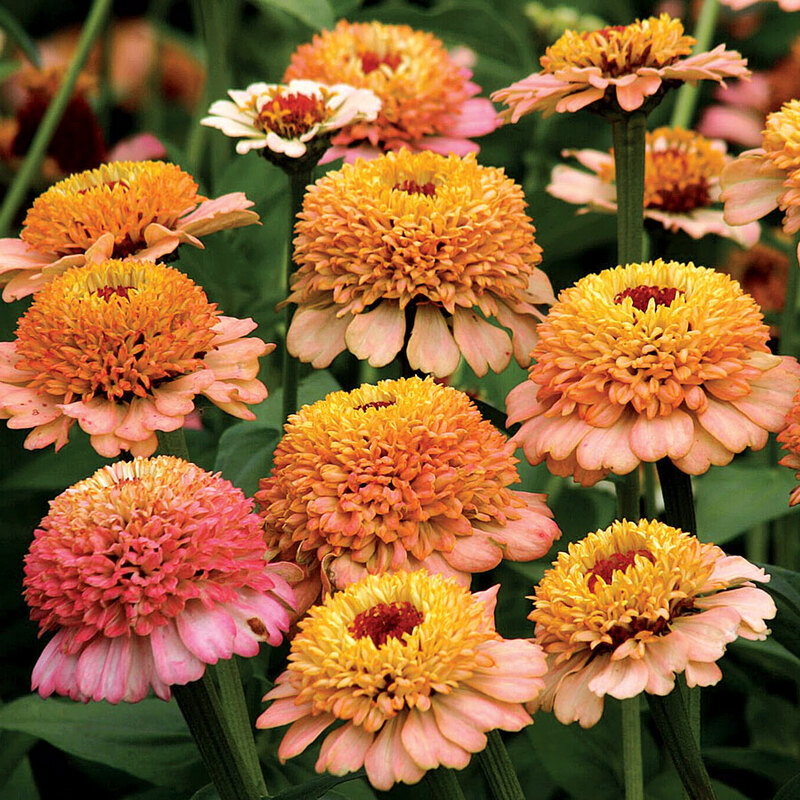 They are tall and narrow, just like a stovepipe. A landspout is a tornado that does not develop from a supercell thunderstorm as a wedge or cone tornado would. Instead, they form when a developing towering cumulus cloud occurs over any near-surface boundary of converging winds. In other words, the area of rotation originates near the surface rather than aloft. That rotating air is stretched vertically and eventually grows into a landspout. A waterspout is also a type of tornado and is essentially a landspout over water. As described above, the source of spin for their development is near the surface rather than aloft. The warm waters surrounding Florida provide warmth and moisture for growing clouds that can commonly spawn waterspouts. Those waterspouts mostly stay over the open water as a hazard to mariners. When waterspouts form from thunderstorms, however, they can track onshore and produce damage. Sometimes you'll hear meteorologists or storm spotters say, "The tornado is roping out." This is a reference to a tornado ending its life cycle where it appears as a rope-like appendage hanging from the cloud base. Though the so-called rope tornado may appear narrow and more elongated horizontally than earlier in its life cycle, it's still capable of significant damage on the ground until it ends. Once the tornado has dissipated, a new twister could develop from the same supercell thunderstorm should a new area of rotation form. Having the "nado" in gustnado would suggest this is a type of tornado, but it's not. A gustnado is a small and typically weak area of spin on the leading edge of a thunderstorm outflow. Since gustnadoes are not connected to any cloud base, they are not considered tornadoes. They are sometimes reported as tornadoes, given their appearance on the ground. Gustnadoes can also cause minor damage. To see what a gustnado looks like, check the video at the link below.